Figuring out how much to charge for music lessons is a difficult and time-consuming task that a lot of peripatetic music teachers face on a regular basis. It’s a difficult thing to decide, especially when you’re just starting out. There are multiple factors involved when deciding how much to charge for your music lessons. Continue reading to better understand what you should be considering when deciding how much to charge for music lessons, or if you’re a teacher looking to revise your fees, you can use this blog to help check that you’re in line. There can be different price points depending on how many students you teach at any one time. 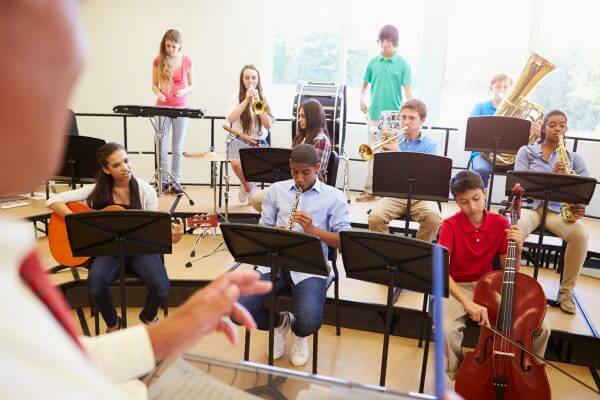 Some students may benefit from group lessons, and the social interaction between multiple students, while others may depend on the directionality of the instrumental tutor. If a student chooses to be taught privately, they are effectively taking up more of your time and effort and you can, therefore, set these at a premium rate. Prices for individual students within group lessons can be set lower. However, having multiple students in each lesson slot means multiple incomes stream over a smaller period of time, which might lead you to earn more money than one slot of private tuition. Choose the groups carefully and ensure that prices match up for each student in their respective groups and you will be on your way to earning a decent amount of money per lesson. How much to charge for music lessons depends on the student’s age and playing ability. I started my guitar lessons in a school, and because of the guaranteed number of students that would be taught by my teacher, he was able to charge a lower fee per student. Each of these students was an absolute beginner, so there wasn’t a huge amount of effort involved, and it was likely that the school or the child’s parents were paying for the lessons. The teacher’s low price would make it attractive to those just wanting to try something new. On the opposite end of the spectrum, it is important to remember that even professional players benefit from tuition. These may be infrequent, and the musician’s past experience of tuition will most likely allow for you to set prices for these clients higher. These lessons may be less frequent, but the higher cost will hopefully mitigate any difficulties. With this in mind, make sure you assess the situation to see what people might be able to pay. You don’t’ want to stereotype different age groups, but a middle-aged student is likely to have more disposable income in comparison to a teenager, so you should set prices appropriately, in my experience on a case-by-case basis is the best route. It’s amazing that you have a lot of students, but don’t forget that you have business costs as well! Whether you teach at home, in a dedicated space, or travel to your student’s houses, you will still have expenses that need to be paid regularly. You should attempt to set up prices that cover fuel or any travel expenses for the average distances per day, and prices that still allow you to purchase food, and even treat yourself, once the bills are paid. With this, remember that you could have a couple of students who pay a premium fee, but if you can get a steady stream of students who pay smaller amounts each lesson, it’s very likely this will be more beneficial in the long term. While a lower fee may look less appealing, make sure to remember that it all adds up in the end. You should also consider if you have managers or supervisors over you. Are you working in a school? If yes, that’s guaranteed business. Are you traveling? Is fuel covered? This depends on where you are. For example, the capital city like London could be over £40. There are different views on this. In my experience, I’ve set prices for lesson durations as shops might do for buy one, get two for ‘x’ deals. Say I charge £25 per half hour lesson. For an hour-long lesson, rather than double prices, I would charge the student £40. In this way, they can view this as a saving, but in reality, it is an upsell for me if minimum prices that the lesson might have to be is £20 because of costs or more. Of course, this also depends on whether it’s private tuition or a group. Regardless, I tend to prefer longer lessons as I feel the student might be able to settle and get more out of it when compared to shorter lessons. Finally, education really is priceless. That being said, if you’re an accomplished performer or recognized tutor, it is likely that you will be more in demand and therefore able to increase prices. In such cases, your value will precede you and people will pay for your services. Keep working to a high standard and it will be maintained, and word might even spread! If people really want to learn and it’s proven that you can teach to a high standard, they will come on their own. With all of this in mind, what really needs to be expressed when figuring out what to charge for music lessons is the value of music in culture. If the student holds music in high esteem, they will be more likely to pay higher for good tuition. However, external actions make it difficult to place a satisfying price on anything to do with music, such as the reduction of the price of its consumption with the increase of streaming, and other factors. As a teacher, and provider of a service, you need to put forward your prices with confidence. You aren’t just teaching, you’re providing a valuable experience containing memories, life skills, and lessons. These are all priceless. For this reason, don’t be afraid to charge what you think you’re worth, as well as the prices that cover your initial costs. Those that respect your value will pay, and the ones that don’t won’t matter in the long run. What are your philosophies on how much to charge for music lessons?